For introductory Earth Science lab courses. 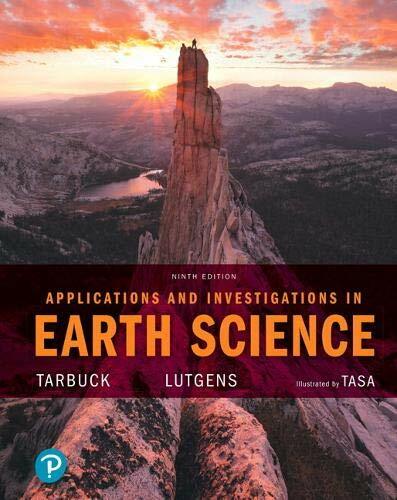 Designed to accompany Tarbuck and Lutgens' Earth Science and Foundations of Earth Science , this manual can also be used for any Earth science lab course and in conjunction with any text. It minimizes the need for faculty instruction in the lab, freeing instructors to interact directly with students. Widely praised for its concise coverage and dynamic illustrations by Dennis Tasa, the text contains twenty-four step-by-step exercises that reinforce major topics in geology, oceanography, meteorology, and astronomy. Mastering™ is the teaching and learning platform that empowers you to reach every student. By combining trusted author content with digital tools developed to engage students and emulate the office-hour experience, Mastering personalizes learning and often improves results for each student. With a wide range of activities available, students can actively learn, understand, and retain even the most difficult Earth Science concepts. Note: You are purchasing a standalone product; Mastering Geology and Pearson eText do not come packaged with this content. Students, if interested in purchasing this title with Mastering Geology or Pearson eText, ask your instructor for the correct package ISBN and Course ID. Instructors, contact your Pearson representative for more information.